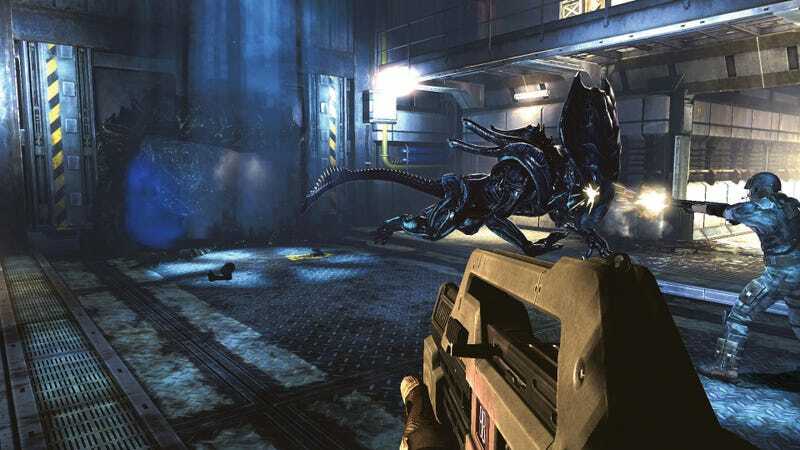 I checked out the multiplayer mode for Aliens: Colonial Marines at this year's PAX East, but E3 got a new map and a new shotgun to play around with. My E3 multiplayer round against the aliens pit us four marines against them on large slabs of shiny black rock. What made this map interesting was how difficult it was to see the similarly black and shiny lurkers crawling over the rock. They blended into the map like oversized, gross chameleons. While you're walking on the lowest level looking for your teammates, a lurker can surprise jump you from behind. They're quite quiet and stealthy, those grimacing fiends. I ran into the big crushers again, as well. I found myself often surrounded by lurkers, which made taking the already tough to take down crusher even tougher. The only other difference in this convention's demo was that the HUD was redone to move dynamically with your sight and movement. It was much smoother and more polished, as were some of the animations on the aliens. And even though the machine at my kiosk froze up at the end of the round (those things really overheat at conventions, especially when locked away in cabinets), I at least got to see the perfect animation still, where I had just blown off the head of a lurker. Its green guts were mid-splatter, head already blown clean off, with my shotgun still kicked back. I'm just as enthused to play the high-intensity rounds of multiplayer in Aliens: Colonial Marines as I was when I first took it out for a test drive at PAX East. Here's hoping next time I get to actually play as the aliens.